Ageas Salisbury International Arts Festival runs every summer in the Historical City of Salisbury. 2014 marked the beginning of the four year programme exploring the theme of the Sun as it is tracked across Night and Day East and West. The Festival ran from end of May to first week in June and included arts from Scandinavia, as well as exploration through dance, literature, drama, and comedy and music. The opening weekend launches the Festival and offers free Street Arts, Family Events, Fireworks based in Salisbury Cathedral Close and across the City Centre. 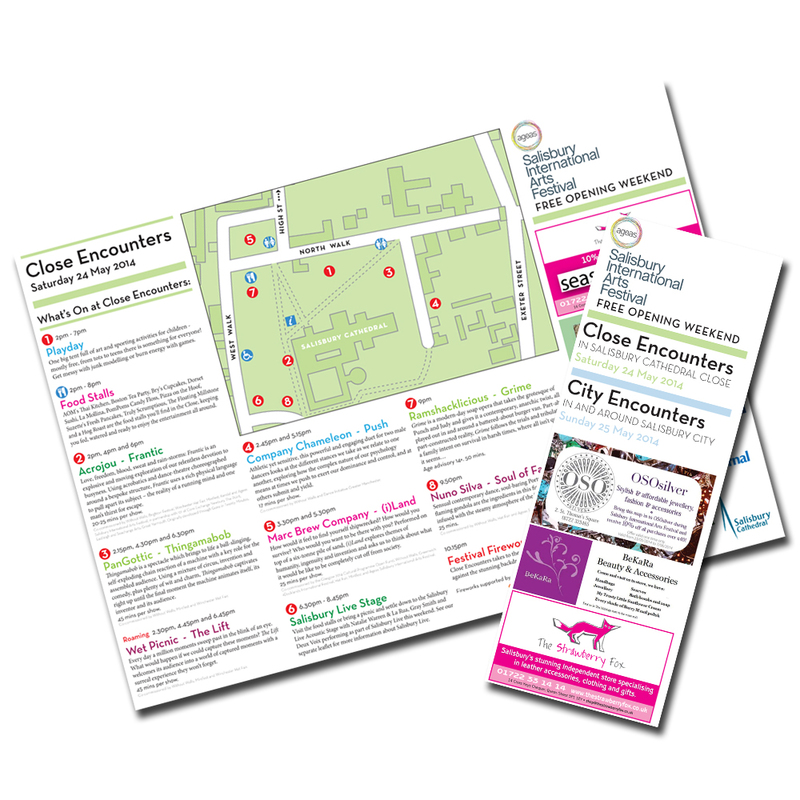 Ageas Salisbury International Arts Festival commissioned Addison Design to create a map for the opening weekend of the Festival held over Sat 24th and Sun 25th May with two events running – Close Encounters and City Encounters. The map needed to show clearly what was going on, where it was happening and on what day. We also needed to take into account space for details on the various shows and stalls to attract members of the public – many of whom would not be familiar with Salisbury or the Festival. We felt the whole leaflet was very clean and clear. Addison Design understood the festival’s brand and supplied something that sat well within our suite of marketing leaflets for the year. We were delighted that they were able to turn the leaflet around in the time and budget available and very grateful for the way that they handled issues such as drawing up one of the maps from scratch. Thanks for all your hard work and we look forward to working with you again in future.